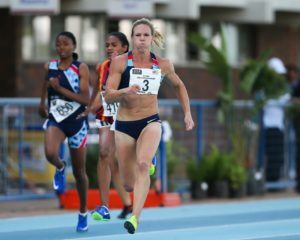 Fresh off her SA record run in the women’s 100m semi-finals at the national championships on Thursday, 15 March and winning the national title on Friday, 16 March, Carina Horn has confirmed her appearance in the same event at the Liquid Telecom Athletix Grand Prix Series Final on Thursday, 22 March 2018 in Paarl. Horn blitzed the race in 11.03sec to outrightly own the national record after having shared it with Evette de Klerk for 3 years. De Klerk ran 11.06sec in 1990 to set the South African record, a record that was shared since 2015. Horn has come close to breaking de Klerk’s record on a few occasions. The first time was in Madrid on 11 July 2015 where she equaled the record. The second time was a year later in Durban at the CAA 20th African Senior Championships where she finished second behind Murielle Ahouré, clocking 11.07sec. In near perfect conditions, Horn ran the 11.03sec that sees her crowned as the new SA Record Holder. She has had a spectacular indoor season in 2018, breaking the indoor national record twice over 60m, first running 7.10sec in Eaubonne (France) on 09 February, before breaking it again two days later in Metz where Horn was timed at 7.09sec. “We were a bit surprised about her indoor season as her start is not (yet) the best,” said her coach Rainer Schopf. “But that bode very well for the Championships. Once we get her start right, the sub 11 is definitely on the cards. After her record breaking performance in the semi-finals, Horn returned the following day to claim the national title, winning in 11.08sec. Horn will now line up as the headline act in the women’s 100m at the Liquid Telecom Athletix Grand Prix Series Final on Thursday, 22 March in Paarl. Visit the event’s Facebook page for daily announcements!